Details: Abandoned by her father during the Depression, eleven-year-old Elsie lives in the garage behind her old house with her mother, grandmother and out-of-work uncle. Elsie’s friend Ernest accompanies her as she searches for her father in the city, encountering unfriendly hoboes, food lines and shanty towns. After both her uncle and her mother disappear as well, Elsie and Ernest spend their time trying to get the “scoop” on a story about a local dance marathon, where Elsie finds joy, even as she witnesses despair. 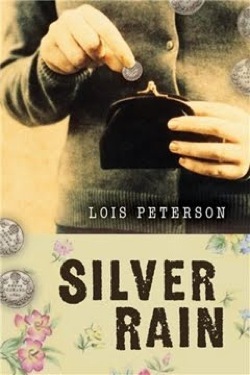 CV: Having written for adults for more than twenty years, publishing scores of short stories, articles, and personal essays in international markets, Lois Peterson turned to writing for children in 2007. 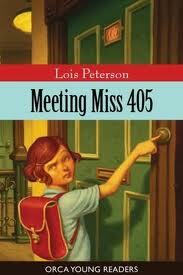 In November, her first book MEETING MISS 405 was published in fall 2008 by Orca Book Publishers. It has since won the BC Chococalte Lily Award and been nominated for the OLA Forest of Reading Silver Birch Express Award and the Saskatchewan Diamond Willow. Lois Peterson also the author of 101-and more-Writing Exercises to Get You Started & Keep You Going, and a popular Vancouver-area creative writing instructor, workshop developer, and storyteller. 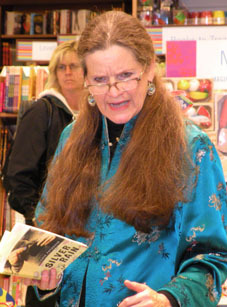 She contributes how-to writing articles to writing Magazines, including The Writer and maintains a website at http://www.loispeterson.net. To place a bid, please leave a comment in the box below. 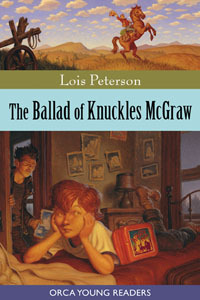 Item: A signed copy of The Ballad of Knuckles McGraw by Lois Peterson. Details: After eight-year-old Kevin Mason’s mother abandons him, he takes refuge in his fantasy of becoming Knuckles McGraw, a tough cowboy roaming the plains on his legendary horse, Burlington Northern. But instead of riding the range, Kevin is stuck in a foster home with a pierced and tattooed teenager named Ice and a mute girl named Breezy. While he waits to be claimed by the father he barely remembers or the mother who left him a good-bye note in his lunchbox, Kevin (aka Knuckles McGraw) tries to communicate with Breezy, learns to get along with his bunkhouse-mate Ice, and discovers that memories can be as deceptive as family secrets. CV: Having written for adults for more than twenty years, publishing scores of short stories, articles, and personal essays in international markets, Lois Peterson turned to writing for children in 2007. In November, her first book MEETING MISS 405 was published in fall 2008 by Orca Book Publishers. It has since won the BC Chococalte Lily Award and been nominated for the OLA Forest of Reading Silver Birch Express Award and the Saskatchewan Diamond Willow. THE BALLAD OF KNUCKLES McGRAW came out in spring 2010, and will be followed by SILVER RAIN (fall 2010) and STALKER (Spring 2011) Lois Peterson also the author of 101-and more-Writing Exercises to Get You Started & Keep You Going, and a popular Vancouver-area creative writing instructor, workshop developer, and storyteller. She contributes how-to writing articles to writing Magazines, including The Writer and maintains a website at http://www.loispeterson.net. Details: Life is hard enough for Tansy with her depressed mom away indefinitely and her dad making a mess of things at home. But then Dad sends her down the hall to a wrinkly old babysitter named Miss Stella, who Tansy hates on sight. Miss Stella has a unique perspective on life, to say the least. But with the help of her best friend Parveen, Tansy gradually learns to manage all the changes in her life and make unexpected new friends in the process. To make a bid, please make a comment in the box below.